I thought I'd add some reviews of my favorite garden cookbooks, since I keep getting comments asking for them on the Homestead Library page. These are my personal favorites. I'm sure there are lots of awesome books out there that I simply haven't read yet. 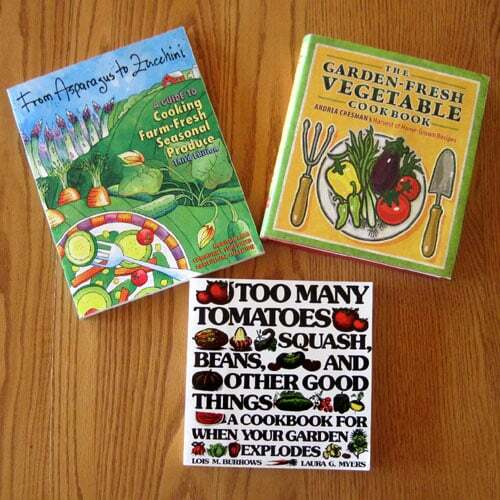 If I find any other garden cookbooks that knock my socks off, I'll add them later. The Garden-Fresh Vegetable Cookbook starts with a list of pantry staples you would do well to have on hand to whip up pretty much every recipe in the book, and basic recipes such as herb vinegar, pesto, toasted nuts, pie crust, cheese sauce and others that have a variety of uses. There is a section of “Master Recipes” that can be readily adapted to whatever vegetables are on hand. The book progresses seasonally with “spring to summer”, “early to midsummer”, “mid to late summer” and “fall into winter”. Specific veggies are sorted alphabetically in the season they are most available. 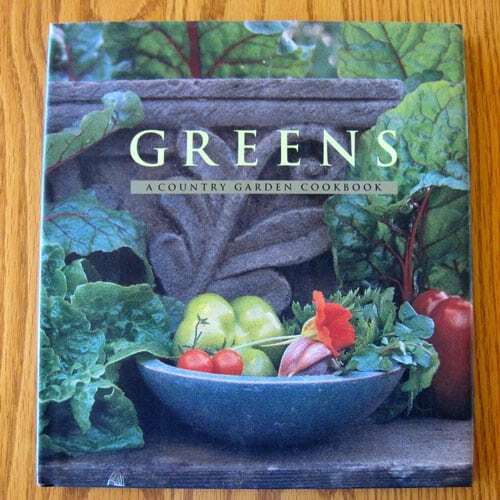 Each veggie has an introduction, brief information on growing and harvesting, and basic cooking techniques, along with more detailed recipes. There are stories sprinkled throughout about “cooks who love to garden, and gardeners who love to cook”. Recipes are detailed and concise, and easy to follow. Substitutions are suggested in many recipes in case you don't have the specific produce listed. This is book predominantly about “homestyle comfort food”. There are ethnic specialties like haluska and stracciatella, but overall the flavor range is pretty mellow, which is a good fit for my family. From Asparagus to Zucchini opens with an introduction to seasonal eating and discussion of the many benefits of supporting local agriculture . Following this, produce is listed alphabetically (indeed, from “asparagus” to “zucchini”, as advertised). Each entry gives a brief overview of the vegetable, including origin and nutritional benefits. There are cooking and storage tips, along with an assortment of recipes. At the end of the book there are combination recipes grouped by season, a section of “Kids Recipes”, and some basic home food preservation information. The recipes tend to be simple, with an ingredient list and a paragraph of instructions. Flavors run the gamut from southwestern to Asian, with influences from a number of other cultures. There are also recipes for herbs and edible flowers, and a pretty substantial resource section at the end to help you connect with regional farmers and those who support them. Too Many Tomatoes has nearly 300 pages of information on how to prepare vegetables that are commonly grown in backyard gardens. Each veggies entry includes some background information; growing requirements, calorie, carbohydrate and food value information; and detailed instructions for harvest, storage and cooking – including complementary herbs. Recipes are “homey”, although there are quite a few combinations and preparations I wouldn't have thought of myself. Almost all call for standard pantry items, with liberal use of fresh and dried herbs. (lol – getting hungry looking through all the recipes again). Simple illustrations – not a flashy book, but packed with recipes. Get Fresh! : How to Cook a Kumquat and Other Useful Tips for More Than 100 Fruits and Vegetables focuses on how to select, store and prepare common and exotic fruits and vegetables, nutritional profiles and recipes. There are color photo inserts of some more and less common produce items. I bought this one because every once in a while I like to buy something unusual, just to try it, and I wanted to have a reference on hand to know what to do with those odd bits. If you've never been a big produce eater and would like to know more about a food before you eat, this is a must have book, as it describes both flavor and texture of the food. 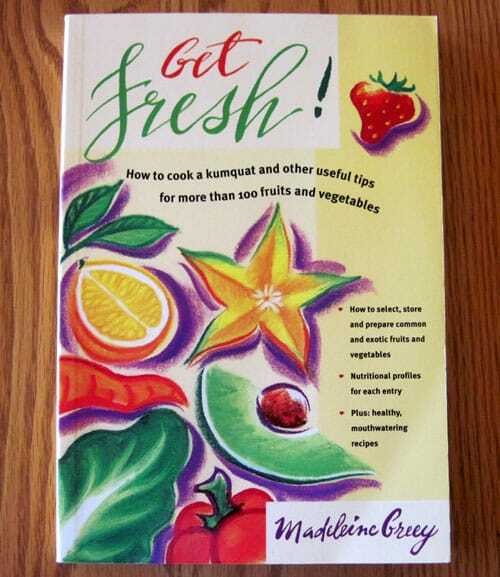 Read it, and you'll know how to pick out the best quality produce available, as the author gives clear tips on how to know if a fruit or vegetable is ripe and properly harvested. The Whole Organic Food Book: Safe Healthy Harvest from Your Garden to Your Plate is as much about why to eat what we eat as how to eat it. It discusses organic methods of growing, six main types of foods, and the whole and organic foods community. They cover grains, dried beans, cool weather shell beans, hot weather shell beans, quinoa and amaranth, and garlic. This would be a great book for those on a budget looking to stretch their harvest and their food dollar. 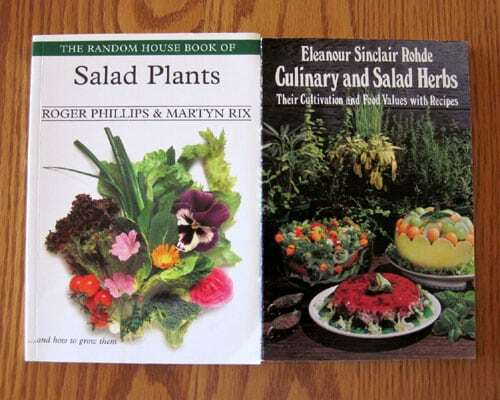 Random House Book of Salad Plants and Culinary and salad herbs : their cultivation and food values, with recipes are two small “pamphlet” type books with lots of information on all things salad and herb. Salad Plants is loaded with even more photos than the Greens book. It's a really beautiful book to look at if you can track down a copy. 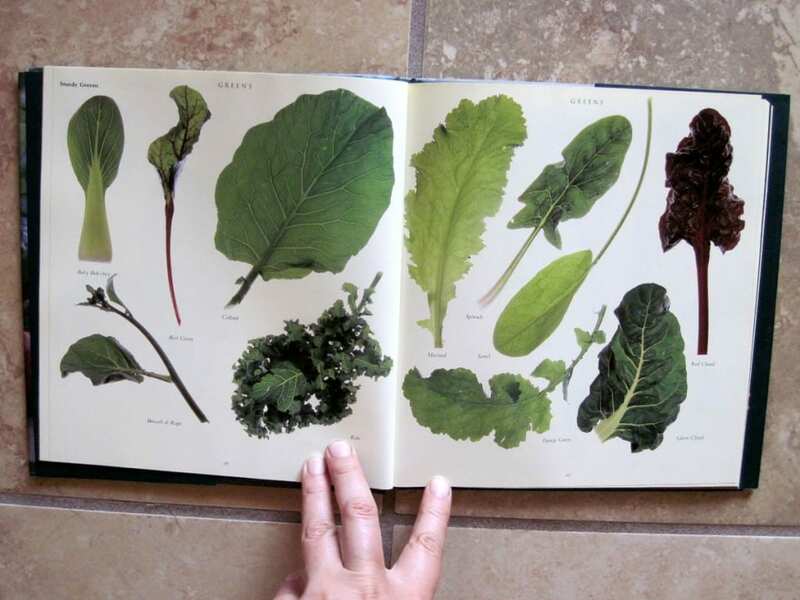 The book explains how to choose, plant and maintain a wide variety of salad plants. How you eat them is up to you. Culinary and Salad Herbs is mostly text based, with a few illustrations. The author gives descriptions and uses of over 50 culinary herbs, as well as instructions for drying, basic recipes that work well with a variety of herbs and some unusual recipes such as “herb pudding”. 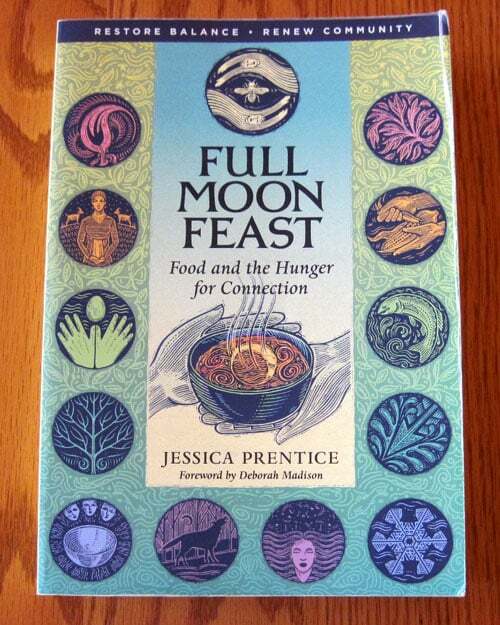 Full Moon Feast: Food and the Hunger for Connection looks for the history and meaning of the food as the author shares seasonal recipes. I thoroughly enjoyed reading this one. Jessica is a great storyteller, and working my way through this one made me want to be an alewife or wortmonger of old. So much has been lost of traditional food ways. I think I'd need a lifetime or two to make a dent in them, but this book made we want to try. Only one complaint – the edge of the book started delaminating a bit, as you can see in the upper right corner of the photo. Hopefully if they publish another round at some point they can improve the quality a bit. This book deserves to be strong enough to be passed around. I just wanted to add to you list my favorite garden cookbook: “The Victory Garden Cookbook”, by Marian Morash. It looks to be out of print, but if you can find a copy, snap it up!